My life didn’t look very promising,” admits Dr. Scott Hoffer. As a child he was extremely sick. He suffered from severe colic as a baby and then the real health problems ensued in the coming years. “I was literally allergic to the world,” explained Dr. Hoffer. At one point in time the medical doctor tested Dr. Hoffer for 140 allergens and he tested positive to 136 of them. These allergies caused extreme asthma and he also had a severely suppressed immune system. In elementary school he would miss 30-40 school days per year due to colds and infections. Since his father was a pharmacist, Dr. Hoffer had access to all the best medications and doctors in the Phoenix area. In the 4th grade it was discovered at a school screening that Dr. Hoffer had scoliosis which is an abnormal curvature of the spine. He was evaluated at the Phoenix Children’s Hospital and surgery was recommended to correct the problem. Thankfully, his mother had just started to see a Chiropractor for her headaches that a nurse had recommended. His mother and father decided to try chiropractic for his scoliosis. His breathing instantly improved and his health and immune system started functioning for the first time as he only missed two days of school for sickness the next year. Dr. Hoffer never had the scoliosis surgery and excelled in the sport of swimming. Through his high school and college swimming at Arizona State University he utilized chiropractic to improve performance. This was before most college teams and professional sports utilized chiropractic care for optimal performance. Dr. Hoffer couldn’t imagine what his life would be like with out ongoing chiropractic care so he decided to become one. Dr. Hoffer graduated from ASU with a B.S. in Organizational Communications and then continued on to Palmer Chiropractic College-West. 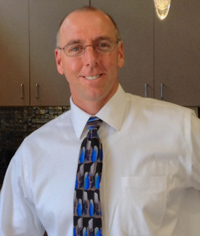 After graduating from Palmer he came back home to the North Phoenix and Scottsdale area to start his practice in 1994. Since 1994 Dr. Hoffer has worked on many professional golfers, ASU athletes, high school athletes, and hundreds of families. He met his wife Allison on the ASU swim team and they have two athletic boys. His family is a living testimony of the chiropractic lifestyle which includes regular chiropractic care, exercise, and optimal nutrition. Give our Scottsdale chiropractic office a call so we can help you take your first step towards better health and a better life.